Find and compare the best prices from a range of well known car rental companies at La Rochelle Airport. This is a free to use facility, enabeling you to book direct with the company quoting the price. 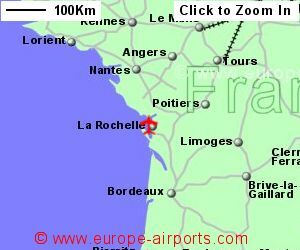 La Rochelle Airport, otherwise known as Airport, is located 5Km north west of La Rochelle centre, on the western coast. La Rochelle has a well preserved old town and harbour. 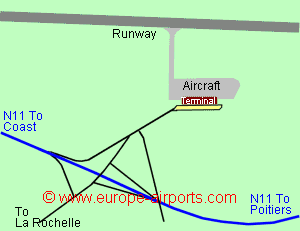 The airport is situated beside the N237 which runs from Poitiers, round La Rochell to the island, Ile de R�. A bus service connects La Rochelle airport to the town, running approximately every 30 minutes during the day and early evening, Monday to Saturday, costing 1 Euros 30 for the 15 minute journey. Facilities include a bar restaurant, a shop, and a selection of hotels are located within the area. 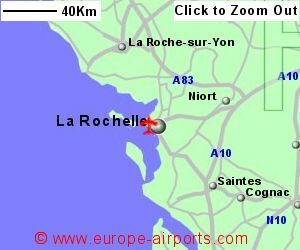 La Rochelle airport has Airport Carbon Accreditation, at the Mapping level. 221,000 passengers passed through La Rochelle airport in 2016, an increase of 2% compared to the previous year.